Proper oral care and maintenance can greatly prolong the lifespan of porcelain veneers, but even the best cared for veneers may need replacement at some point. 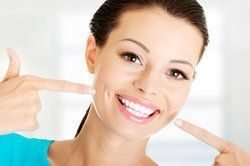 Read the following overview from Brooklyn dentist Maurice Benjamin to learn about the lifespan of porcelain veneers and when replacement is needed. Porcelain veneers will last well over ten years if cared for properly. Foregoing regular brushing and flossing, skipping dental visits, and chewing on hard objects can greatly reduce the lifespan of porcelain veneers. Poor oral hygiene can lead to problems with porcelain veneers, as it can lead to decay of the underlying teeth. Chewing on hard items like pen caps, fingernails, and ice can chip or damage porcelain veneers. Fortunately, properly caring for veneers is about as easy as caring for natural teeth. Practicing proper oral hygiene by brushing at least twice a day and flossing at least once a day will help keep your teeth and gums healthy and your veneers at their best. It is also recommended to use a soft bristled brush to avoid brushing too aggressively, which can damage veneers. Seeing your dentist for regular check-ups and cleanings is a must to ensuring a long life for veneers (and your natural teeth), as this helps catch problems at the earliest stages. Dental decay: Porcelain veneers are thin restorations supported by the natural tooth. Veneers cover the front of the teeth, but the actual tooth structure is still vulnerable to decay. Cavities can form on the natural tooth and if this is happens, veneers may need to be removed and replaced so the dentist can remove dental decay. Damaged veneer: Chewing on hard items like metal or plastic pens or an injury to the face can chip and fracture porcelain veneers. Anytime a veneer is damaged, it is important to seek replacement to keep the teeth healthy and looking their best. Loosened veneer: Over time, the material used to bond the veneer to the tooth can loosen from daily wear and tear. A loosened veneer leaves the natural tooth vulnerable to plaque and bacteria, which can collect under the veneer and lead to decay and cavities. Loose veneers should be replaced immediately to protect dental health. Noticeable color difference: For some people, a color difference may become apparent if the natural teeth yellow or get professionally whitened. This can make porcelain veneers, which do not respond to teeth whitening and do not discolor like natural teeth, to become noticeably different in shade. Veneers will need to be remade and replaced to correct the color difference. Porcelain veneers are a wonderful solution to quickly and dramatically transform a smile. To find out more information about porcelain veneers or to discuss other treatment options, we welcome you to schedule a consultation with Dr. Maurice Benjamin.